LONDON - Art prankster Banksy has struck again. The spray-painted canvas “Girl With Balloon” went under the hammer at Sotheby's in London, fetching more than three times its pre-sale estimate and equaling a record price for the artist. A video was later posted on the account, stating: “A few years ago I secretly built a shredder into a painting in case it was ever put up for auction.” The video showed images of a shredder being implanted into a picture frame along with footage of Friday's auction finale. 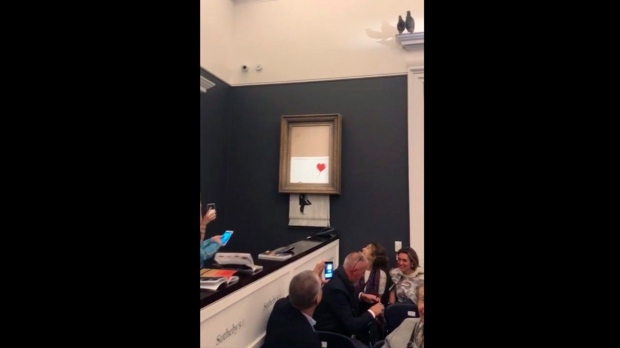 Sotheby's - which had noted before the sale that the work's ornate gilded frame was “an integral element of the artwork chosen by Banksy himself” - appeared as shocked as anyone else. Brooks would not say whether the artist had been at the auction. She said Sotheby's had been “100 per cent” unaware of the planned stunt. 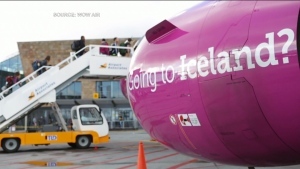 In 2005, he hung an image of a spear-toting ancient human pushing a shopping cart in the British Museum, where it remained for several days before being discovered. The next year he smuggled a life-sized figure of a Guantanamo Bay detainee into Disneyland, and in 2015 he erected a full-scale dystopian theme park - “Dismaland” - by the British seaside. “Girl With Balloon,” which depicts a small child reaching up toward a heart-shaped red balloon, was originally stenciled on a wall in east London and has been endlessly reproduced, becoming one of Banksy's best-known images.